Always wash your hands before working in the kitchen and anytime you touch uncooked meats or eggs. Try not to lick your fingers. Mise En Place- Everything goes in its place. Pulling out ingredients and setting it up will make it easy to add when you need it.Keep it all in one place and put I back their when you are done. Cleaning up with The Bag Holder is a breeze but remember to put everything away where you found it to make it easy to use for next time. If you don’t take the time to clean up the kitchen when you are done the head chef may not let you back in, so ask what else you can do before leaving. Cooking can give children a great sense of satisfaction. When children cook, they are learning many skills, including math and reading skills as well as how to work together and building confidence . They also get a chance to practice motor skills through things like pouring, stirring, and measuring. Cooking is a great sensory experience that children enjoy. When you use The Bag Holder and the recipes that can go with it you are setting the stage for learning and fun through cooking. More mealtime at home was the single strongest factor in better achievement scores and fewer behavioral problems in children all ages. More meals at home also resulted in less obesity. Making meals together brings the bond of family stronger. Since time is short using The Bag Holder and bags is an easy alternative to getting dinner on the table. Cooking with children can be messy! Children can pick up on our tension if we’re worried about messes. Then they could become nervous. If you are relaxed about messes and mistakes, the children will be too. 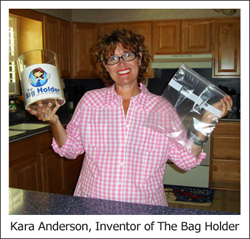 Using the Bag Holder helps keep you relaxed and allows your child to enjoy making a meal with you.